Three of our archival collections are more accessible: their finding aids are available online, both on our Archives and Manuscripts page and in our online catalog. The Medical Society of the County of New York was founded in 1806 and exists today as the New York County Medical Society. At 68 linear feet, it is one of our largest collections. The records document the society’s changing role over time. In its early years, the society regulated the medical profession in Manhattan; by the 20th century, it focused on education and public health concerns. The Charaka Club is a small, New York-based society of doctors interested in the historical, literary, and artistic aspects of medicine. The collection contains minutes, correspondence, publications, talks, and other materials. The talks, some which were not published in the club’s Proceedings, may be especially interesting. The Physicians Relief Fund was a charitable organization that provided financial relief or loans to physicians and their dependents in times of need. 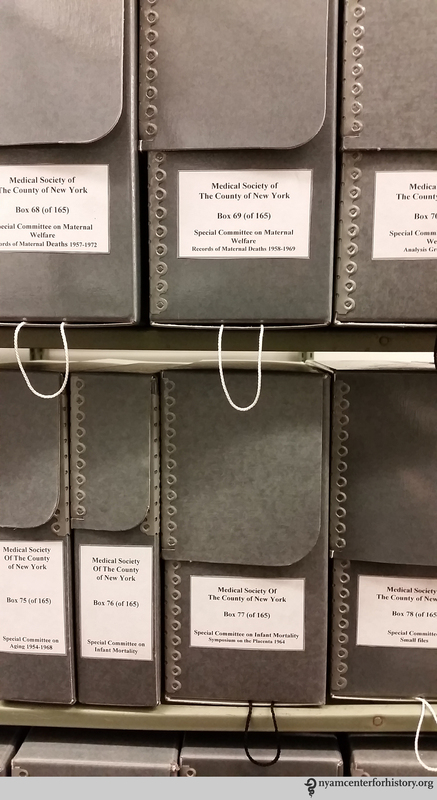 If you are interested in using any of these collections, please contact us at history@nyam.org. More finding aids will become available online in 2015. This entry was posted in Collections, History of medicine and tagged accessibility, archival collections, archives and manuscripts, finding aids, online research by nyamhistorymed. Bookmark the permalink.